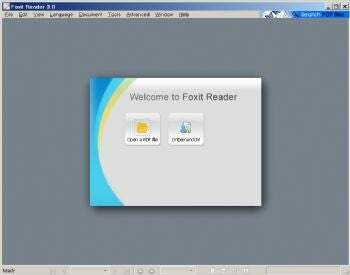 I first ran across Foxit Reader while searching for a lightweight alternative to Adobe Reader, which for several major revisions grew increasingly bloated and slow. Foxit fit the bill nicely, though for a few versions I still had to keep the Adobe product on hand for graphics intensive PDF files. Now though, Foxit is the only PDF reader I use. It's been a long while since I've run across a PDF file that Foxit Reader doesn't handle perfectly. It takes up far less disk space than Adobe Reader, and--even with much quicker performance of more recent versions of the latter--it's still faster. I've even used the Windows Mobile version of Foxit Reader on my now deceased Blackjack Smartphone with excellent results. I must admit I was a bit worried when I read the list of new features in the latest 3.0 version of Foxit Reader. After all, I started using the program because of its speed and lack of bloat. I needn't have worried. It's still only a 4MB download and despite new multimedia handling features, thumbnail and layers view panels, and some other enhancements--it's still fast, though perhaps a tad slower loading than previous versions. As with many free programs, there's some advertising to sit through. The install asks to add a Foxit toolbar as well as an eBay shortcut, and it wants to set your homepage to Foxit Software, so don't just blindly click through. Also, though the free version handily lets you alter content, there are watermarks in the finished product that are only removed when you purchase the $40 Pro Pak version. All in all, Foxit Reader is the way to go--unless you simply like wasting time and disk space with Adobe's fatter app.